As a result of earlier student concerns in 2016, the university separated the Honor Code Office from the Title IX Office, which ensures women’s equal treatment on campus. 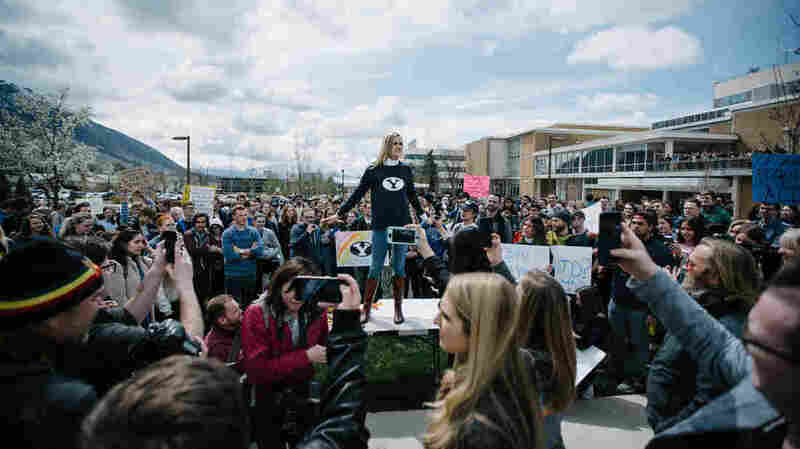 In addition, BYU added an amnesty policy under which anyone who reports an incident of sexual misconduct, including a victim, will not be disciplined by the university for any related honor code violation occurring at or near the time of the report. But students claim there are still problems. Among those leading the recent protest was freshman Grant Frazier, who says he wants less punishment and more compassion. “The Honor Code, as many of you may know, was made by students for students. So it needs to be reformed by students,” Frazier shouted as he revved up demonstrators. We believe in the Gospel and we think the Honor Code Office has forgotten that. And it’s our job to remind them. “It’s about all of you sharing your stories of hurt and feeling like you’re rejected and feeling like you don’t fit in at BYU. But I’m here to tell you that you do. I don’t care who you are!” she said. The director of the Honor Code Office declined to be interviewed. But he said in a statement that the office has met with more than 200 concerned students. He added that only about a dozen of the school’s 33,000 students are expelled each year for Honor Code violations.